Had a visit from the UK a couple of weeks ago. Kat and Becca were travelling about and ended here in the World's Cycling Capital. They are both members in the rather fantastic dance troupe The Spokes. "The only all female bicycle dance troupe in the UK". They didn't dance on their rented bicycles - not as far as I saw anyway - but they enjoyed cycling about the city. On 'an explore' as Winnie the Pooh would have put it. That's Kat, above and here's Becca, below. Becca is resting her foot on the cyclist railings we put up in this city to spoil our cycling citizens. 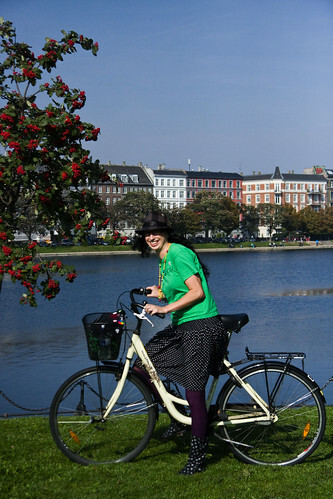 Becca blogged about their time in Copenhagen on her blog. You can check out The Spokes on their website and be sure to check out their films. wow those spokes really get around! can't wait for the halloween performance! Go Spokes! I hear there is another bicycle dance group called the Velocibicis, based in Bristol UK. The two groups had a dance off at Bristol bike festival last month to celebrate the many joys of bike dancing... I also hear that the Spokes left their most cycle chic member at home. She can be seen riding a Pashley Poppy around Manchester most days! Come on Europe, we need more bike dance groups and we need them now! Anybody who has ever met a Spoke or indeed seen them perform will know that the Spokes are simply amazing! After all, they are the ones who put the "o(o)ve" in "moves 'n grooves" (as well as all the "ree" in the lesser known "freewheelin' & green"). Do come and admire them somewhere around Manchester soon! Excellent love the Spokes, great to see them in Copenhagen!